Deep near the bottom of a Canadian lake lies a 46lb Lake Trout. He didn't get that big by being impulsive when it comes to food. He's likely been hooked at least once before in his life, and he didn't like it. There are many such specimen cruising the depths of Canadian and Northern United States lakes. These fish prefer large, deep lakes which is where you'll find them. But in order to catch them, you're going to want to have some knowledge of the best bait for Lake Trout. Lake Trout are a prized catch, and highly targeted fish around many lakes of the Northern United States, and Canada. They need cool water, which is why they are mostly found in very large, deep lakes. They will be found closer to shore and surface in winter months, but relocate to the cool depths during summer. They can live up to, and over 25 years. The majority of Lake Trout caught range in the 10 pound range, but they grow well over 50 pounds. If Lake Trout are what you're after, you'll need to know what to use for bait. You'll also want to know where and how to find them. The best advantage fishermen have when it comes to finding Lake Trout, is their need to be in cool water of a certain temperature. 53 degrees is right around their comfort zone, which means that top water is usually too warm. Shallow waters of the shoreline lack enough oxygen content, and are also higher in temperature most of the year. Your best bet at finding Lake Trout, is in deeper water fishing ledges that drop off considerably. A quick drop of 60 – 110 feet is prime ground. Other potential locations include shelves or ledges along the lake rim, that drop straight down into deep pools. Watch also for schools of bait fish, as Lake Trout will often be found underneath such food sources. Lake trout can be a frustration to fishermen because they can be hard to find. Patience is key, but use of some technology and good old fashioned word of mouth information will increase your chances. Sonar equipment can be extremely valuable when pinpointing the depths you desire. The fish finder can tell you if the trout are there. Always stop into local tackle shops. It's worth spending a few dollars, even if you're already geared up, just to pick the store owner's brain. They'll have a good idea where the trout are hiding, and point you to the right kind of bait for the particular lake. Fishing live bait is an effective technique, and Lake Trout will eat small to larger size bait fish. The minnow is a preferred choice of bait when going live, though small salmon and night crawlers are also know to work. Lake Trout fishermen will often fish these ledges with live bait rigged in different distances along their line. This allows them to fish the ledges at two or three different depths along it. They can have a bait at the start of the drop off, put one down at the bottom, and add one to the middle if they desire. Lake Trout do often keep in groups, though not packed tightly together like bait fish. So if you do hook one, chances are there will be more nearby. Bait fishing is a perfect method for beginners because it gives them a chance to become familiar with the gear, without needing a lot of skill and experience. Find more valuable info about Lake Trout at fishingtipsdepot.com. Live bait isn't the only strategy when it comes to catching Lake Trout. Deep trolling along the edge of these underwater ravines is also an effective practice. You can either use live bait, lure, or both (hook the bait right to your lure). Jigging the depths will also work to hook up. Using the Texas rig, drop down to the bottom. Bounce it straight up and down off the bottom a few times, then if not bit reel the jig back up moderately. Watch to see if a trout follows, as they often feed like this from the depths. They like to come up, and attack from behind. Lastly, Lake Trout can be fished from shore or ice during winter. If you're fishing from shore, find a deep pool you can access, or cast to. If you're fishing the ice, remember that Lake Trout come up higher in the water because of the cooler temps up top. Conservation efforts are in place in many Lake Trout waters. 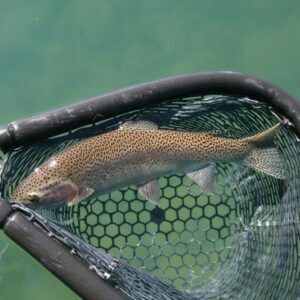 Knowing the exact regulations of the lake you fish can keep you out of trouble, and keep the trout population healthy. Lake Trout are one of few species of fish that are able to allow air out of their gills as they rise. This means they won't burst a gall bladder on the way up due to pressure change. They can be released with the proper handling. Always be sure to wet your hands before you touch these fish, or you will destroy their protective layer and scales. Lake Trout can make quite the meal in areas where capture is allowed. Coincidentally, there are some water systems that Lake Trout have been deemed an invasive species. They have grown in number, and are eating off other populations of important fish. I though it was interesting when I first read about a mandatory kill regulation. When it comes to the best bait for Lake Trout, the choice is completely up to you. You have several choices, and using the one that is most comfortable to you is probably the best choice you could make. Using the depth and fish finder on your vessel can also be a challenge. Sticking the anchoring on a ledge, or following the contour of the ravine on a troll run takes practice, but is all part of the fun. The biggest Lake Trout I heard about was 72 pounds exactly. That is one big fish. Tell us your big fish story in the comment box, or on our social site. We can't wait to hear about it. Stay well, and stay fishy.